Tri-Cities unemployment rates dropped to numbers locals haven’t seen for 20 years and it’s begging the question: Are we at full employment? If the answer is yes, it’s full employment or a natural employment level for a restructured economy that bears little resemblance to the one of 20 years ago. Employers added 1,400 nonfarm jobs in April and the region’s unemployment rate dropped to 4%. Johnson City had the lowest city jobless rate – 3.6%. Preliminary, non-adjusted numbers from the Bureau of Labor Statistics’ payroll survey show the bet year-over-year job growth gains in the four-county Kingsport-Bristol MSA were in construction; professional and business services; leisure and hospitality; and government. Job growth in the three-county Johnson City MSA wasn’t as strong across the board, but there has been a big gain in professional and business services. Trade, transportation and utilities and government also posted strong year-over-year gains. 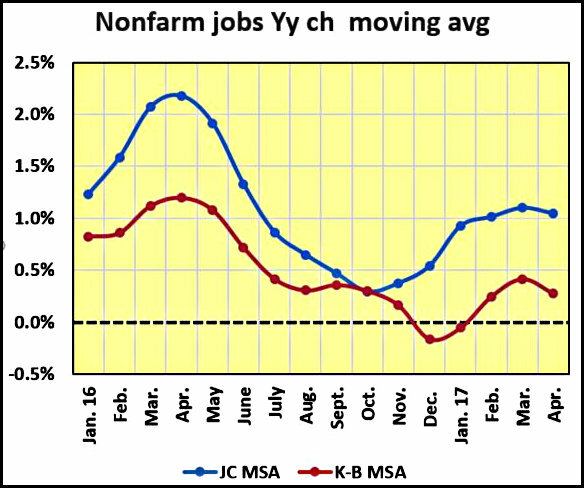 Johnson City also had more nonfarm jobs in April than it did in April 2008 – the monthly pre-recession benchmark. Preliminary numbers from the household survey show April employment 1% higher than April last year, and the labor force is up 0.6%. Some of the glow of April’s good news comes off when the numbers are compared to pre-recession highs. While employment is up, there were 1,898 fewer people with jobs, and the labor force is 22,666 below the pre-recession high. And, there were 1,700 fewer nonfarm jobs in April than there were in April 2008 – the year before the Great Recession’s full effects hit the local labor market. A longer view shows the nonfarm job creation rate trend continued its slow upswing, but April’s year-over-year rate was less than half of what it was in April last year. So, what is the new natural or full employment here in the Tri-Cities? There’s no simple answer to that question because the term defines a condition where all the people who can easily or usefully be hired are working, and new hires occur by luring people from other jobs by offering them higher wages. A rapidly aging population creating a wave of retirements, technology that has decimated the manufacturing sector and conversion to a service-oriented economy have dramatically changed the local labor market and economy. Some – primarily those with higher education levels and skill sets – have prospered. Others continue to struggle on a playing field where the economy has rendered the region’s strong blue-collar, middle-class benchmark lifestyle to nostalgia status. Today’s economy is increasingly about the haves and the have-nots where local governments struggle to create and preserve jobs by attacking the structural underemployment problem with training and education. All of that is happening at the same time when the region has to depend on attracting new residents to sustain its population base. The natural population problem can be simply defined this way: For every 10 live births, there are 13 deaths. Unemployment rate – 4%, the lowest since December 2000. Nonfarm jobs – 203,500, up 0.4%. 1,700 fewer than pre-recession high. Employment – 218,440, up 1%. 18,898 fewer than pre-recession high. Labor force – 227,520, up 0.6%. 22,686 fewer than pre-recession high. Unemployment rate 3.9%, the lowest since September 1998. Nonfarm jobs – 81,300, up 1%. 100 more than pre-recession high. Employment – 86,830, up 1.5%. 9,105 fewer than pre-recession high. Labor force – 90,380, up 0.9%. 10,980 fewer than pre-recession high. Nonfarm jobs – 122,200, no change from last year. 1,800 fewer than the pre-recession high. Employment – 131,610, up 0.7%. 8,498 fewer than the pre-recession high. Labor force – 137,140, up 0.3%. 11,738 fewer than the pre-recession high. Unemployment rate – 3.8%, the lowest since December 2000. Employment – 11,090, up 0.5%. 1,104 fewer than pre-recession high. Labor force – 11,530, down 0.7%. 1,356 fewer than pre-recession high. Unemployment rate – 3.6%, the lowest since December 1998. Employment – 30,190, up 1.5%. 1,094 fewer than pre-recession high. Labor force – 31,330, up 1.02%. 1,451 fewer than pre-recession high. Unemployment rate – 4.1%, the lowest since December 1999. Employment – 21,570, up 0.5%. 647 fewer than most recent high. Labor force – 22,500, down 0.1%. 1,745 fewer than most recent high. + Kingsport’s employment and labor force are reported from the most recent high because that market recovered from pre-recession highs in 2011 then began slowly arching lower. + Since April’s jobs and employment numbers are preliminary expect adjustments with next month’s report. The monthly adjustments are typically small. The major adjustments are made in an annual adjustment. So what is the effect of real time information on capitalism? Furthermore, within a generation of super-advancement of technology (especially robotics), will capitalism destroy capitalism? Interesting stuff——-interested in your thoughts!! Don this is dramatic information. I would like to see the hard number of employed similar to how you graph the percentages. I think this could reach a wider connection of this situation.